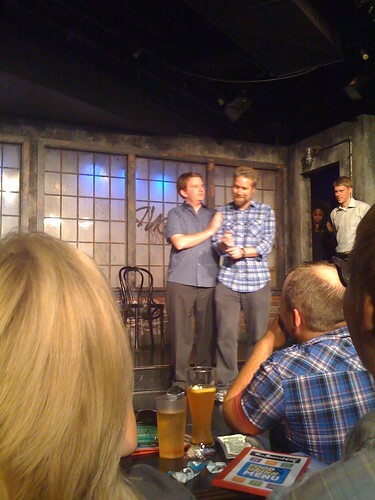 Last night Erica and I went to see the new Second City E.T.C. show, The Absolute Best Friggin' Time of Your Life . We'd heard that it was a good show and that our friend Beth Melewski was good in it. Happily, both things were true. The show is both one of the most personal Second City shows I've seen, and also one of the most starkly political. And it's funny. "Rubenesque!" Our friend Becky Eldridge was sitting right behind us and after the second act we got to talking about the improv set (which those in the know just call "the set") and being invited up to play. The structure of a Second City show is that they do two acts of scripted comedy and then a third act of improv. A fair number of people leave after the "real" show, so they open up those seats and the set is free to watch if you just show up at the Second City theater at the right time (that's a little Chicago cheap-fun idea for you right there). The cast will also invite up friends and colleagues who happen to be in the audience. It can be something of a political thing, who is and isn't invited up, especially at the Mainstage with a bunch of improvisors in the audience. Becky had done the set a few times before, and I've done it once at the Toronto Second City. Just as we were discussing all of this, Mary Sohn came out and asked Becky, Erica, and I if we'd like to play. Erica declined, but Becky and I both were game. It was fun playing with the cast—I know most of them but have really only performed with Becky and Beth. And I think it was ideal circumstances—when the cast is developing a show, the improv set is the incubator for new scene ideas and so there's a certain pressure. But with the show so new, it's set in stone for a several months at least and the set is just for fun. And I can't front—this was something of a check-list item for me. I just did two scenes, but I feel like I can check off the mental "perform on a Chicago Second City stage" (I've done a couple of rental and festival shows up in the Donny's Skybox stage, but somehow that doesn't count). And that leads to the out-of-order-ness. Now that I've completed that goal, on Sunday I start taking my first ever Second City class. Oops. For years, doing comedy in Chicago whenever you talk to someone who's not in the scene they inevitably ask if you've taken classes at Second City. And I just never did. And I'm not even, still, doing the improv and sketch programs that Second City is known for. I'm taking the new stand-up comedy program. I've been toying around with the notion of standup for a couple years now—doing a couple of open mics and slots kindly provided in friends' shows. After years of putting together or participating in big, complicated shows like the Neutrino Project and Don't Spit the Water, the idea of solo performance, just a performer and audience, is very attractive. So I'm taking this class to provide a little structure as I begin to really explore what kind of standup comedian I am. And, since I wouldn't actually put myself into a totally foreign situation, because I'm an old man, I'm taking a class taught by a friend and taking it with another friend.